A-IHM Institute of Hotel Management is one of the premier Hotel Management institutes in India that was established in the year 1996 by I.M. Advertisers. Since then, the institute has created its own identity as one of the oldest private hotel management establishments in the field of Hospitality industry. The institute is located in Agra near Ghaziabad. A-IHM Institute of Hotel Management is getting to be known not only for its undergraduate courses but also for International Diploma and MBA course in Hotel Management. The Admission Registration Fee for AIHM Institute Agra / Ghaziabad - Rs 26,850. It features well maintained campus that hosts a wide variety of buildings and blocks meant for training. 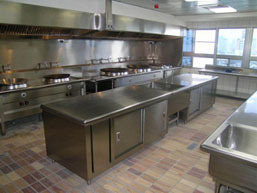 It has training food production areas, where the students are trained for food productions. The institute also has training restaurants that are used for food and beverage service training for the students. It also has highly maintained housekeeping center, Computer room and library. The institute also offers separate hostel facility for boys and girls. As far as placements are concerned, the institute has received stunning industrial response with regard to the recruitments of their graduates. After the successful completion of course, the qualified candidates are recruited to the leading groups in the field of hotel managements such as Taj, LE MERIDIEN, HILTON, HERITAGE, HYATT and RAMADA. Are you Interested in AIHM Institute of Hotel Management.